Kikkeri narayanshetty naveen1, Arunkumar JS2 and Suraj shetty1. Aims: To study the spectrum of vitiligo and to screen for audiological abnormalities. Materials and methods: Hospital based observational study was conducted to know the spectrum of vitiligo and screening was done for audiological abnormality to detect asymptomatic sensorineural deafness in all patients. Results: 56 patients were included in the study with mean age of 27.6 years. Vitiligo vulgaris was the most common type. The initial site of onset was the lower limbs followed by the face. Sensorineural deafness was detected in 7.14% of cases. Conclusion: In the present study vitiligo vulgaris is the commonest type, and the initial site of onset is commonly the lower limbs. Audiological examination must be done in all cases of vitiligo to detect early onset of sensorineural deafness. Vitiligo is an acquired primary, usually progressive, melanocytopenia of unknown etiology, clinically manifested by circumscribed achromic macules often associated with leukotrichia and histologically by degeneration and disappearance of melanocytes in the involved skin and not infrequently in the pigment epithelium of the eyes, leptomeninges and inner ear. The highest incidence has been recorded in India and Mexico. Incidence has been roughly estimated as 3-4% in India. The frequency in the population is probably the same in both sexes and between 30-40% have a positive family history. Inheritance may be polygenic or may be determined by an autosomal dominant gene of variable penetrance. The present study is undertaken to know the spectrum of vitiligo, otological abnormalities. No such studies have been conducted in northern Karnataka. Hospital based observational study was done from march 2012 to December 2012 after obtaining permission from the Institutional Ethical committee. After obtaining a written informed consent, all patients were submitted to a full history taking, general medical and skin examination, otological history & examination. Otolaryngological examination done and those clinically suspected with sensorineural hearing loss were subjected to pure tone audiometry. Audiometry was performed using a pure tone audimeter (GSI-61 clinical audiometer) in a sound proof room. Pure tone thresholds were determined for each ear at the frequencies of 250-8000 Hz for air conduction and 250-4000 Hz for bone conduction. Patients who were exposed to factors known to be responsible for sensorinural hearing loss e.g. ototoxic drug intake, noise exposure or systemic diseases were excluded from the study. Patients not willing to undergo otolaryngological examination were also excluded from the study. After applying the exclusion criteria, a total of 56 patients were included in the study. The mean age of the patients is 27.6 years ranging from 9 years to 57 years. There were 6 children below 12 years. The male: female ratio is 1.2:1 with male preponderance. 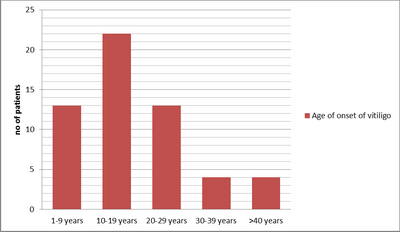 Majority of the patients were students (n=25).The mean age of onset of vitiligo was 17.9 years (fig1). Twenty-three patients had their first onset of vitiligo before the age of 12 years. The mean duration of vitiligo was 8.8 years. 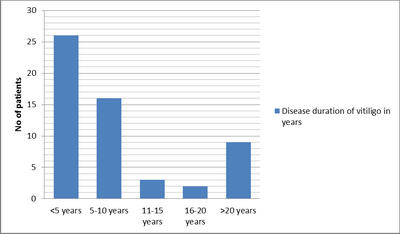 The majority of the patients had a disease duration of 1-5years (n=26) (fig 2). Twenty-three patients had positive family history. Generalised vitiligo was the most common (n=31) clinical type followed by focal (n=25) and acrofacial (n=5) with 2 lip-tip variety. Segmental and universal type was not seen. Onset of first lesion was more on lower limb(n=29) mostly on the ankle (n= 9) and shin area (n=8 ) followed by face (n=11 ), trunk (n=8 ), and upper limb (n=4 ). Otolaryngological examination was done to all patients. Four patients had sensorineural hearing loss (SNHL), out of which 3 were female and 1 was male with a mean age of 24.5years. Vitiligo patches were present over the ear area in 11 patients, out of which 1 patient had sensorineural hearing loss. Lower limbs, mostly shins and ankles, were the common site of onset followed by face, trunk and upper limb. Lower limbs are more prone for minor abrasions, and it could be the reason for initial site of onset. In the study conducted by Dogra et al  on the late onset vitiligo, head and neck was the most common site of onset and of presentation. Vitiligo patients may have sensorineural hearing loss when compared to healthy subjects. In the present study 4 (7.14%) patients had sensorineural hearing loss. These patients were asymptomatic but on audiological evaluation found to be having mild to moderate (26 to 55 dB) bilateral hearing loss. In a study by Angrisani et al., hearing loss was seen in 12.5% of vitiligo cases. In the study conducted by Sharma et al., 18.9% of vitiligo patients had bilateral hearing loss at 2000 Hz to 4000 Hz. In the present study, only clinically suspected patients of sensorineural hearing loss were subjected to pure tone audiometry. Pure tone audiometry in all patients with inclusion of high frequency audiometry, Otoacoustic emissions and BERA would have given more significant results. Hence all vitiligo patients require audiological evaluation even though they are asymptomatic to detect early onset of sensorineural hearing loss. Vitiligo starts early in life and has a strong genetic predisposition. In our study vitiligo vulgaris is the commonest type, and initial site of onset is the lower limbs. Audiological examination must be done in all cases of vitiligo to detect early onset of sensorineural deafness. 1. Dhar S, Dutta P, Malakar R. Pigmentary disorders.In: Valia RG, Valia AR, editors. IADVL textbook of dermatology. Mumbai: Bhalani publishing house 2010: 749-751. 3. Liu JB, Li M, Yang S, Gui JP, Wang HY, Du WH, et al. Clinical profiles of vitiligo in china: an analysis of 3742 patients. Clinical and experimental dermatology 2005; 30: 327-331. 5. Akay BN, Bozkir M, Anadolu Y, Gullu S. Epidemiology of vitiligo, associated autoimmune diseasesand audiological abnormalities: Ankara study of 80 patients in Turkey. JEADV 2010; 24: 1144-1150. 6. Pradhan V, Patwardhan M, Thakkar V, Kharkar V, Khopkar U, Ghosh K, et al. Vitiligo patients from India (Mumbai) show differences in clinical, demographic and autoantibody profiles compared to patients in western countries. JEADV 2013; 27: 279-286. 7. Dogra S, Parsad D, Handa S, Kanwar AJ. Late onset vitiligo: A study of 182 patients. International Journal of Dermatology 2005; 44: 193-196. 8. Wang X, Du J, Wang T, Zhou C, Shen Y, Ding X, et al. Prevalence and Clinical Profile of Vitíligo in China: A Community based Study in Six Cities. Acta Derm Venereol 2013; 93: 62-65. 9. Angrasani RMG, Azevedo MFD, Pereira LD, Lopes C, Garcia MV. A study on otoacoustic emissions and supression effects in patients with Vitiligo. Rev. Bras. Otorrinolaringol 2009; 75(1): 111-115. 10. Sharma L, Bhawan R, Jain RK. Hypoacusis in vitiligo. Indian J Dermatol Venereol Leprol 2004; 70: 162-64.